The Solomon’s scored first when Solo Kuki found the net with a strike from the edge of the area but any hopes they had of a comfortable afternoon were quickly put to rest. Tamaiva Smith pounced just before half time to draw Cook Islands level and give them a fighting chance to add to their sole win at the tournament, a 6-2 triumph over Tonga. Cook’s had several goal scoring goal opportunities but failed to make them count and Solomon’s punishing the Cooks with three more goals to extend their lead by four goals to one. Coach Tuka Tisam thought his team worked hard but struggled to maintain their efforts over the 90 minutes. 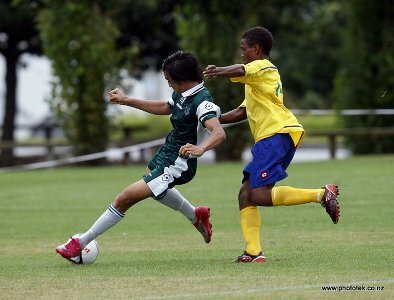 In the last day of action today, Vanuatu will take on Solomon Islands in the 3rd/4th play-off at 1.30pm (NZT) before the grand final showdown between New Zealand and Tahiti at 4pm. The team is due to depart for our shores on Thursday.